Time will conquer. Humans can attempt to freeze it and keep it, trick it and say: “You’re not going to take it away from me.” But it will win – every time. You can express yourself as well in five minutes as three hours. I’m basically a short film-maker. I’ve never had the big, big grants. I could use $250,000 from the MacArthur Foundation, sure. But mostly I make “cine-poems”. 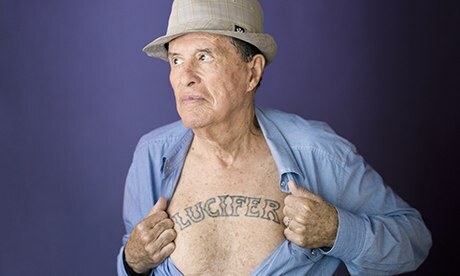 Lucifer is not the devil. He’s the god of light and colour. Luciferous – I bring the light. To me Satan and Lucifer are totally different entities. I’ve never bought drugs in my life, but I’ve known people with the money to buy them. People like Keith Richards or Mick Jagger. And if they had something to offer me, I’d take a little sniff. My siblings hated me because I was the artist. I had a bitchy older sister, Jean, who identified me not by Kenneth but by BCA – Birth Control Accident. I live alone. I have no so-called partner and am very independent. My most valuable possession is my passport. It’s my escape hatch. I carry it in my breast pocket. My grandmother knew Busby Berkeley and he was cruel. In Footlight Parade he had girls dive into shallow water and their knees were scraped bloody. The water was stained pink by the time he was finished. Digital film won’t be permanent. If we project ourselves 50 years in the future, when we want to watch something on digital from 2012, it will be gone, disintegrated. A lot of things are going to be missing in the future. Marianne Faithfull claimed I hypnotised her. The truth is I cast her as Lilith, the evil twin of Lucifer [in Lucifer Rising] and I was good to her at a difficult time – she was a heroin addict. She even brought heroin into Egypt, where we were making the film. She hid it under her face powder. I’m reasonably proud to be American. I don’t think our wickedness is as bad as Russia’s. They killed millions just to prove Stalin’s power. There is a third volume of Hollywood Babylon [the controversial book of film industry scandals that Anger published in 1959] but it can’t be published because of a very nasty group who call themselves Scientologists. They put rattlesnakes into people’s mailboxes – that’s a fact. It’s a rather exotic way of trying to frighten people.